U2 LIVE IN BOSTON was released on DVD on November 20th in the USA and on November 26th in the rest of the world. 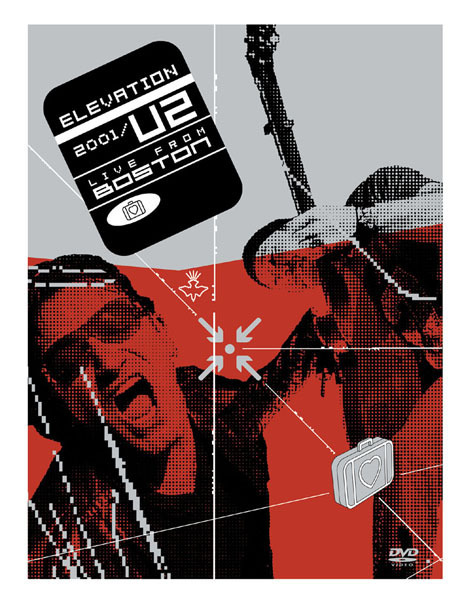 'Elevation 2001- Live From Boston' was shot on June 6th at the Boston Fleet Centre with 20 cameras under director Hamish Hamilton. Disc 1 contains the 1 hour 47 minute full show featuring classics such as Beautiful Day, Sunday Bloody Sunday, Where The Streets Have No Name and With Or Without You. Disc 2 contains Another Perspective - the full show again but this time with an 'alternate camera' feature in which viewers can compare and contrast the view from the 'Bono cam', the 'fan cam' or the 'Director cam'. This second disc also features 'Road Movie' - a 5 minute time lapse sequence showing the staging of a rock and roll concert from empty arena to a full arena and back to an empty arena again. 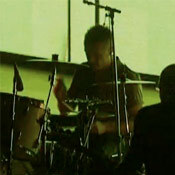 And there are also three bonus tracks including Beautiful Day (live from the Clarence Hotel, Dublin September 2000) and Elevation (live from Miami, opening night of the Elevation Tour, March 2001).